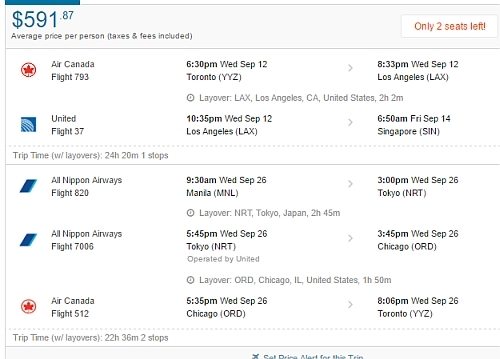 United Airlines and All Nippon Airways are showing open jaw flights where you fly from Toronto to Singapore - and then home from Manila, Philippines - for $590 CAD including taxes. The flight between Manila and Singapore is not included. A one way flight from Singapore to Manila generally costs between $60 to $90 CAD on airlines like JetStar. Or, you can also fly from Toronto to Singapore, and then home from Bangkok, Thailand - for $668 CAD roundtrip. A one way flight from Singapore to Bangkok generally costs around $50 CAD on airlines like Jetstar. NOTE: September and October are considered to be in the typhoon season for the Philippines. toronto, yyz, flight deals, asia, east asia, singapore, sin, manila, philippines, mnl, united airlines, ana and all nippon airways.